Featuring a $1.99 per month “Special Introductory Offer” hosting offer on its homepage, Web Hosting Pad certainly merits attention. The advertised plan includes leading industry technology like the cPanel control panel, Softaculous apps installer, CloudFlare, SSD database storage, and more. Other positives include unlimited disk space, bandwidth (unmetered), domains hosted and e-mail accounts — and a free domain name. It appears to be an offer too good to refuse. But is it really? Unfortunately, we uncovered issues that tempered our enthusiasm. On balance Web Hosting Pad has earned the NCM Online designation of RECOMMENDED WITH RESERVATIONS. Web Hosting Pad offers two low-cost shared hosting plans — Power Plan and Power Plan Plus. Both include a number of industry standard best practices technologies and unlimited features. 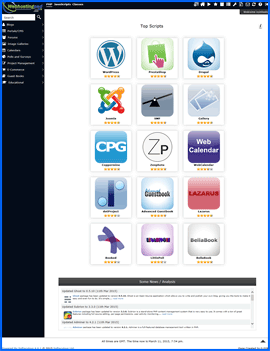 Technologies common to both plans include a free site builder, the newbie-friendly cPanel control panel (screenshot below right), the “1-click” Softaculous applications installer (screenshot below right), CloudLinux OS, the CloudFlare content delivery network, SSD database storage, RAID protected servers, and Access Guardian security scan. Both plans provide a free domain name (first-year only — renews at $14.95 per year), unmetered bandwidth as well as a number of unlimited features including disk space, domains hosted, e-mail accounts, e-mail forwarders, autoresponders, parked domains, subdomains, and mySQL databases. Both plans include 24×7 chat and e-mail support. Phone support is available between the hours of 7:00 AM and 8:00 PM (CST). Both plans are backed by a 99% uptime guarantee, and a 30-day money-back guarantee. The Web Hosting Pad cPanel Control Panel. Click to enlarge. Designed with e-commerce in mind, the Power Plan Plus includes all of the Power Plan‘s features while adding an SSL certificate, SSH access, advanced spam filtering, advanced web stats, business directory listing, and advanced security scanning. A dedicated IP address is available at an additional cost of $40.00 per year. As is our practice, we selected the lowest cost plan — Power Plan — for purposes of testing and review. Web Hosting Pad utilizes a simple — but not quite transparent — 1-step checkout process (screenshot below right). We began by entering the domain name to be associated with the account. The next step was to select a hosting term for the account. The pull-down menu for Power Plan Hosting terms include the following options: $3.99 per month for a one-year plan, $2.99 per month for a two-year plan, or $1.99 per month for a three-, four-, or five-year plan. While the choices seemed simple enough, renewal pricing was nowhere to be found. There were no asterisks marking the prices. This seemed to indicate that the plan rates remained constant. But in fact, they do not. We backed out of the order page to revisit the offer on the home page. The “Special Introductory Offer” for $1.99 per month (regularly $4.95 per month) was indeed marked with an asterisk. We scrolled down to the bottom of the home page where we found, “*See terms for full details,” in small gray print. We then clicked on the nearby “Terms” link. 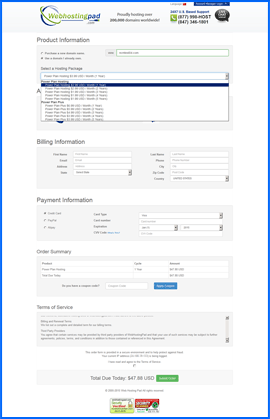 Web Hosting Pad Order Form. Click to enlarge. So while the 1-year Power Plan term cost $3.99 per month for the first year, the renewal price was $5.99 per month for the same 1-year term. The increased renewal price was not a deal breaker in our minds. The fact that Web Hosting Pad had gone to such lengths to obscure the renewal pricing is what we take issue with. Further, while the checkout page did include a scrolling 2,805-word Terms of Service, the only reference it made to renewal pricing was the following: “Billing and Renewal Terms: We list out a complete and detailed term for our billing terms.” No hint was provided as to where one might find these detailed billing terms. The Web Hosting Pad Softaculous Applications Installer. Click to enlarge. NCM Online has and will continue to point out any less-than-transparent business practices employed by the web hosting companies we review — wherever and whenever we encounter them. Further, we have and will continue to deduct from the ease-of-use and satisfaction ratings of any host that utilizes such practices. Web Hosting Pad’s ratings have been adjusted downward accordingly. The Web Hosting Pad “Welcome” e-mail arrived in our inbox 6 minutes after placing our order. We were pleased to see that it provided all of the information required to set up our test site quickly, including the nameservers and FTP login. It is worth noting that like Yahoo Hosting, Web Hosting Pad FTP functionality requires an SFTP client. 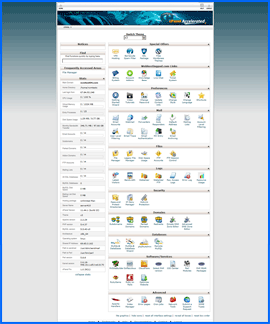 Web Hosting Pad provides web hosting customers with the industry-leading, easy-to-use cPanel control panel (screenshot above right). The Web Hosting Pad cPanel includes the intuitive “1-click” Softaculous Applications Installer (screenshot above right). A favorite of webmasters across the globe, Softaculous simplifies the tasks associated with website application installation. In addition to WordPress, it provides easy access to more than 200 scripts including Joomla, Drupal, Roundcube, Zen Cart, osCommerce, Magento, and many more. 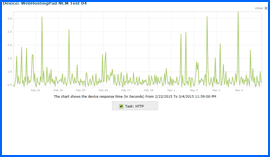 Web Hosting Pad Web Hosting 10-day Uptime Test Results Chart. Click to enlarge. All web hosting services reviewed by NCM Online are subjected to our 10-day test for page-load speed and reliability. 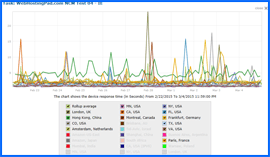 Utilizing the services of Dotcom Monitor, testing began on 2/22/15 and concluded on 3/4/15. Our simple 1-page test site was subjected to a total of 1041 server checks from 13 worldwide locations (Hong Kong, London, Paris, Amsterdam, Frankfurt, Montreal, New York, Virginia, Florida, Minnesota, Dallas, Colorado, and California) over the course of the 10-day test period. We are pleased to report that Web Hosting Pad achieved a perfect, 100% uptime score (see Uptime Test Results Chart right). Web Hosting Pad Web Hosting 10-day Speed Test Results Chart. Click to enlarge. However, the page-load speed testing results were not good. Checked every 15 minutes for 10 days, Web Hosting Pad recorded a slower than average speed of 2.0396 seconds to load our test site from the 13 worldwide locations, and an equally disappointing 1.4339 seconds to load the test site from the 7 U.S. locations (see Speed Test Results Chart right). Despite its ease of use and a wealth of valuable features — slow page-load speeds, and at-least-somewhat-deceptive pricing disclosure policies prevent our unqualified endorsement at this time. Web Hosting Pad has earned 4 stars and is recommended with reservations. Cheap website hosting company price comparisons based on 1-year term list price before coupon/promo codes or limited time/introductory offer discounts. These are the renewal rates for the second year of hosting. To ensure that you receive the most affordable Web Hosting Pad Web Hosting pricing possible, please visit our Web Hosting Coupon Codes page for current discounts and special offers before making any purchases. WebHostingPad was created in 2005 by a group of accomplished and successful veterans of the industry who were dedicated to offering the greatest value in website hosting. The company’s mission was to meet the increasing need for website hosting by providing hosting at such an affordable price that anyone could set up a site on the Web. The firm is still committed to delivering the greatest value in hosting and wants to provide a safe, dependable, and user-friendly way to setup a presence on the Internet. WebHostingPad’s personnel have confidence in the services and products they offer. They provide quick, dependable and complete web hosting services. They believe they are successful in their mission of providing high-quality cost-effective hosting because the company hosts in excess of 200,000 domains. The company continues to raise the standards for quality in web hosting. It has received recognition and a number of awards for its continual efforts to give first-class service to customers. The company is always upgrading its hardware and updating its software so that it can keep pace with the evolving hosting industry. Its servers are top rate and it uses first-class brand name hardware and software in order to give customers the quickest, most dependable web hosting possible. Each hosting plan offered by the company includes the state-of-the-art cPanel Control Panel, which is the leading user-friendly control panel. The company knows that visitors must be able to access its clients’ websites in order for those sites to generate sales. As a result, it offers clients a guarantee of 99% uptime. This provides customers with the assurance that servers will be available and performing a minimum of 99% of the time during each period of 12 months. If a server fails to perform for 99% of the time during a given month, the customer will receive a pro-rated credit for the missed time. WebHostingPad has its in-house data center in Chicago, IL. This center houses one of the most adaptable, secure, and redundant Internet infrastructures in the business. The company’s IBX centers have a 99.999% availability rate allowing businesses, providers of network services and content companies to implement and administer their operations while enjoying unequalled performance, dependability and scalability. Each of WebHostingPad’s website hosting plans comes with a thirty-day money back guarantee. If a client is unhappy with the company’s services for any reason, they can cancel their subscription within thirty days of their initial subscription date and receive a full refund. It is crucial to back up website files so that no valuable data is lost. WebHostingPad offers a simple backup tool so clients can fully back-up their accounts, emails, and databases and be certain that they constantly have fallback data for each site. Unlike some web hosting firms, the company never includes hidden charges in clients’ hosting accounts. WebHostingPad is committed to offering its clients the greatest value in website hosting, and they demonstrate that commitment by providing first-quality, dependable services for some of the most affordable prices in the hosting industry. This video tutorial will show you exactly how to install WordPress on your Web Hosting Pad shared hosting account using the cPanel control panel and the Softaculous applications installer.